A street full of endless culinary opportunities, Victoria Row adds oodles of charm to Charlottetown. 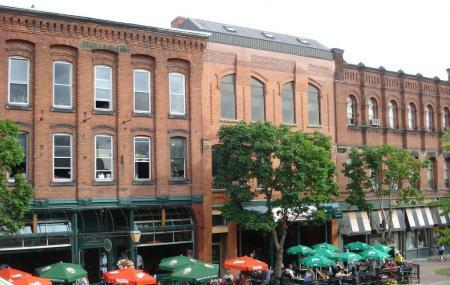 In the warm summer months, Victoria Row offers a choice of indoor and outdoor dining options, with live jazz music provided by local musicians most evenings. The ambiance here is among the best, with a wide variety of seafood and other dishes available, served by candlelight under large umbrellas. A number of pubs also offer a lively maritime atmosphere, accompanied by delicious, yet affordable meals. How popular is Victoria Row? People normally club together St. Dunstan's Basilica and The Guild while planning their visit to Victoria Row.